Once a project is completed, documents are cleared away into files and put into boxes in the store room. This ensures that the successful or finished project details are within reach for any future references. Moreover, completed projects don’t end up piling up and cluttering your workspace. The same could be said with Ganttic. The archiving feature allows users to ‘store away’ projects that are no longer active or needed to be used frequently. To archive a project, in your advanced features bar on top of your planner, click on ‘Group Resources by’. In the dropdown, select ‘Group by Projects’. Your resources should be grouped by projects now. Click on the project that you’d like to archive. In the project dialog that appears, click on the ‘Archive’ button. A confirmation dialog will appear. Click on ‘OK’ to archive your project. To dearchive your project, go to the advanced features bar on top of your planner. Click on ‘Filters’. In the dropdown, check ‘Show archived projects’ and click ‘Apply’. 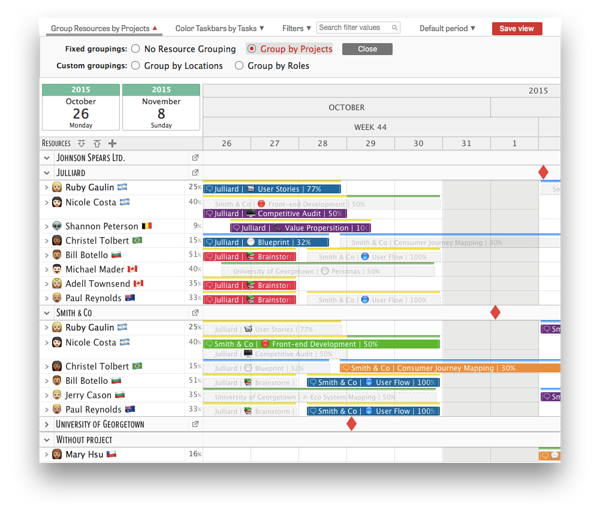 Your planner will reload and show all your projects, including archived projects. Archived projects will have an ‘A’ shown on the right of the project title. Click on the archived project that you would like to dearchived. In the project dialog that appears, click on the ‘Dearchive’ button on the right. A confirmation dialog will appear. Click ‘OK’ to dearchive your project. We are constantly rolling out new features to fit the needs of our users, but in the meantime, there are a few instances that users need to be aware of when archiving their projects. In particular, once a project is archived, you would not be able to generate reports for its data. However, you can easily dearchive the project and generate reports then. Archiving of resources are not available for now, we will keep you updated if a feature as such is launched. Ultimately, archiving projects keep your planner tidy without having to lose any project / task data. If you don’t already have a planner, sign up here for a free 14-day trial with unlimited features.